The existence of a milk tooth is actually very important, as it would later give the place for the growth of the adult teeth. Milk teeth also help babies in chewing food and help talk to both. The gear is part of the digestive process, namely supporting to bite, tear, cut, grind, and chew food. As in adults, milk teeth need to be treated to ease baby in digest food. The number of milk teeth is all 20 pieces. The teeth consist of four front incisors (top and bottom), four incisors aside (its location flanking the central incisors), four canines, and eight molars. When Milk Teeth grow and date? There is a span of time when the milk teeth started to grow, but the average milk teeth will start to appear at the time of a baby aged between 6 months to 1 year. Span varies among infants with one another. In fact, there are some infants who already have tooth milk. Furthermore, the milk teeth will be the date when the age of childhood. Schedule the date the milk teeth can vary in each child. Here's the schedule grew and the date the milk teeth. The front incisors grow at age 8-12 months. The growing side of the incisors at the age 9-13 months. Growing canines at the age 16-22 months. The first major growing molars at age 13-19 months. The second great growing molars at age 25-33 months. The front incisors grow at age 6-10 months. The growing side of the incisors at the age 10-16 months. Growing canines at the age 17-23 months. The first major growing molars at age 14-18 months. The second great growing molars at age 23-31 months. Next date of the incisors at the age of 6-7 years. Next date of the incisors at the age of 7-8 years. Canines date at the age of 10-12 years. Large molars first date at the age of 9-11 years. Large molar second date at the age of 10-12 years. Canine teeth are dated at 9-12 years of age. 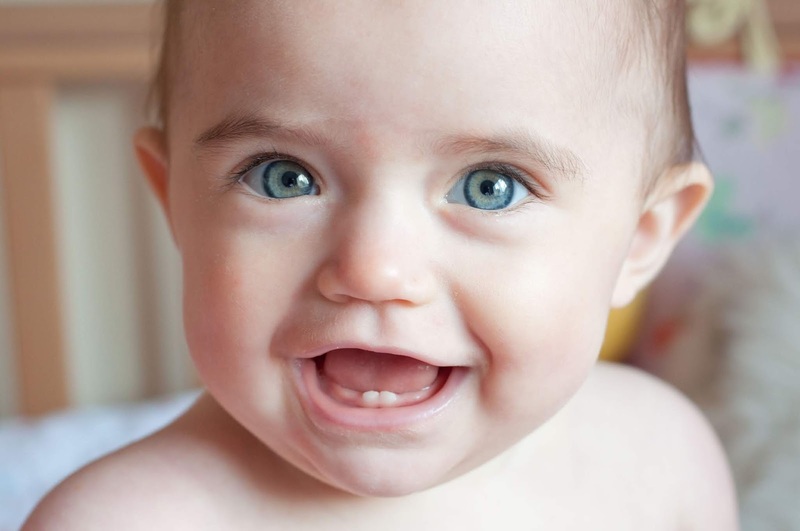 While teething, babies will feel different sensations. There is a baby who does not manifest any symptoms, there are also finicky. Many people associate growing teeth with fever and diarrhea, but there has been no medical proof for this. You don't have to worry, because there is a way to let the baby more comfortable through the process of teething. However, you also need to know that every baby in need of handling. The following steps that you can do. Pay attention to your baby's behavior. When she looks often chew toys or goods which he held, then chances are its teeth begin to grow. Give healthy snacks, such as small slices of carrots, apples, or bread to eat. Use a baby when chewing to avoid the possibility of choking. Teether can help baby to ' forget ' the gums that feels uncomfortable because of growing teeth. To be more optimally, you can save the teether in the fridge. The taste of cold will make gums more comfortable. Noteworthy is the keep the temperature of the teether is not too cold. Avoid storing the teether in the freezer because it will become too cold and hard for the baby. When it began to grow teeth, sometimes the gums become swollen and reddish. You can give a special gel gums. Usually, the baby's gums gel contains a mild local anesthetic to make gums more comfortable and the baby became more quiet. Try choosing a gel that does not contain sugar. Milk teeth should be treated in such a way, to prevent the occurrence of damage. In fact, you can take care of the gums of the baby before her milk teeth are growing. Here's how to take care of your gums and teeth milk Fruit Hearts that you can do at home. Before the milk teeth really grow, you are advised to regularly clean your baby's gums. Use a clean soft rag and a bit wet for rubbing the gums of the baby are slowly. The right time to clean your baby's gums are before she sleeps and after meals, twice a day. If you want to introduce a toothbrush while his teeth begin to appear, rub the teeth and gums with a soft toothbrush. You just need to wet the toothbrush with water and not have to use toothpaste. When milk teeth already appears, use a toothbrush to clean it. Begin using toothpaste just a little, about as big as a grain of rice. When the child reaches three years of age, you can add the portion of toothpaste used to peas. We recommend the menyikatkan her teeth, until older be brushing teeth alone, which is around the age of six. If necessary, use a child when brushing your teeth and remind him to always brush your teeth twice a day. Recommend healthy food with milk teeth and teeth in order to be later survives. Visit the dentist for teeth checked regularly. Take care and get used for teeth cleaning milk as early as possible, it is important. Later, when the child already has a fixed gear, he would be able to take care of him in order to last a lifetime.